Who could resist a film featuring Alan Rickman singing about marrying his adopted daughter! Me, it turns out. Many have criticised the picture for being too gory, although its hard to see how Tim Burton could have avoided the flood of viscera required to depict the story of Sweeney Todd, a barber who murders his clientele by slitting their throats in a specially designed barber’s chair (That I must say did appeal to the mechanical engineer in me), only for their innards to be baked into pies served in the shop below the barber’s. So, instead of toning down the gore, Burton embraces it, commencing the show following a trickle of blood, luminous red against an almost monochrome London, as it drips, seeps and oozes through cracks, down gutters and into the sewers. It is clear from this opening that those of a weaker disposition should stick to a more family-friendly film, such as the Texas Chainsaw Massacre. But the gore isn’t the problem. I can take most horror films, with only Hostel so far causing any undue distress (I can’t take the bit with the eye). No, my problem you see, is the singing. 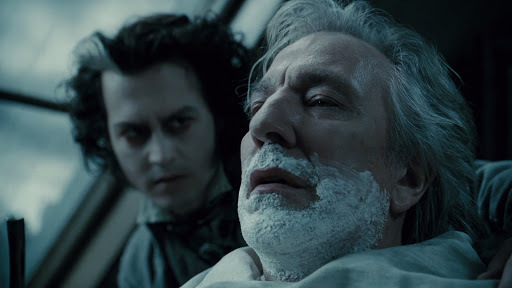 For yes, Sweeney Todd has retained its original music-hall trappings as being a musical, with all of the principle cast, including Rickman’s villainous Judge Turpin, his menacing sidekick Timothy Spall and leads Helena Bonham-Carter as Mrs. Lovett and Johnny Depp as the eponymous Todd at some point or another spontaneously bursting into song. To start with this is fine, with Depp’s husky Bowie-esque warbling complementing the tone of the film, but when plot points are hidden deep inside the occasionally indistinguishable lyrics, and conversations begin to dip in and out of verse as the tune permits it gets a bit tiresome. To be fair, I’m not normally one for musicals, but the subject matter doesn’t seem to lend itself to the medium, and I think if they took out the songs there’s not really enough plot to fill a film. That said, Sacha Baron Cohen steals the show as Pirelli, a showboating rival barber, and there is some impressive camerawork, probably to justify relocating the story from the stage to the screen, but overall I’d give it a miss. Also, why does Anthony Head cameo? He’s onscreen for all of two seconds, and you spend the rest of the film wondering when he’s coming back, yet he never does. The scene’s not even important. And why is Judge Turpin so shocked to see he has stubble on his face? Has he just reached puberty? Is that literally the first time he hasn’t shaved for more than three days? This entry was posted in 05/10, Choose Life, Empire Top 500, Review, The List and tagged Alan Rickman, Helena Bonham Carter, Jamie Campbell Bower, Johnny Depp, Sacha Baron Cohen, Sweeney Todd, Tim Burton, Timothy Spall by jaycluitt. Bookmark the permalink.